Yes, right: Florence is the best town in Italy where people can get directly in touch with Art, and everyone who comes here knows for sure, also only by name, museums like the Uffizi Gallery, the Accademia Gallery or Palazzo Pitti. But only few people know that here in Florence there is much more to see – without standing in a queue for hours and hours. 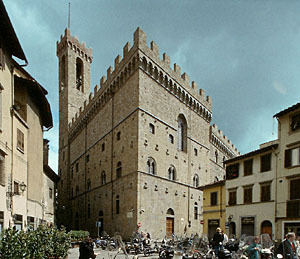 The Bargello Museum is one of the less-known museums in Florence, but it really worths the visit. Its strange name comes directly from Latin: the word “bargillus” means, in fact, castle or fortified tower; that’s what the Bargello Palace, also known as Palace of the people, actually is. Originally used as a prison, this middle age palace is nowadays hosting a rich art collection which includes the masterpieces of artists like Michelangelo, Donatello, Gemito, San Sovino, Della Robbia, Cellini. Going there, you will also have the possibility to see a fine collection of ceramics, textile, tapestries, ivory, silver, armours and old coins. If this is not enough for you, let me tell you that this museums also features the competing designs created by Lorenzo Ghiberti and Filippo Brunelleschi to win the contest for the doors of the Florentine Baptistery. This museum is just one of the visits included in the Institute Galilei’s art history program. Next Next post: Traditional recipes from Florence: the “Ribollita”!